✦ ON SALE!!! 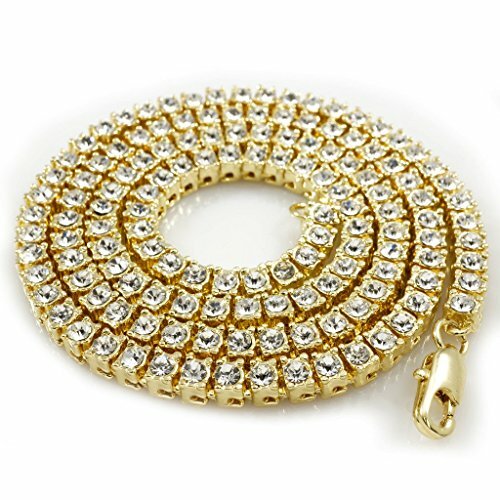 !- This gold iced out necklace is made to anyone's needs. AND IS NOW OFFERED 50% OFF! We have 4 sizes available, 20 inch, 24 inch. 30 inch, and 36 inch. ✦ SUPERIOR QUALITY - We use only FDA approved material to ensure our customers are kept out of harm's way. Made from high quality jewelers brass and plated with pristine 18 karat gold. ✦ PERFECT FOR ALL OCCASIONS - Fully iced out Necklace that can be perfect for any occasion. Wear it for a photoshoot, for a video shoot, to the club, or just for everyday use. ✦ 100% SATISFACTION GUARANTEED - We pride ourselves in providing the highest quality pieces to each and every buyer. If you have any issues with your item, contact us and we will provide you with a refund or a replacement. This iced out chain is made from jeweler’s brass core plated with premium 14k gold plating, hypoallergenic and lead/nickel free. It is flooded with round CZ stones, each individually set by hand by a professional jeweler.